Reading scored two first-half goals to beat Preston North End and boost their Championship survival hopes. 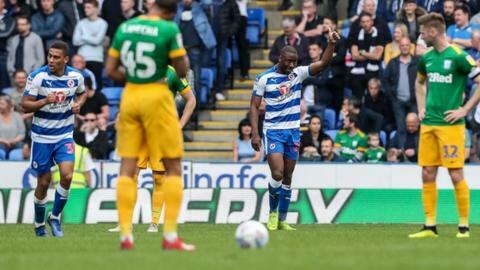 Mo Barrow set up Royals' top scorer Yakou Meite to open the scoring at the Madejski Stadium before the winger intercepted a short back-pass and doubled the hosts' lead. Jose Gomes' side created several chances to grab a third before Preston pulled one back in injury time through substitute Jayden Stockley. The North End striker scored after reacting quickest to Sean Maguire's shot hitting the crossbar, but Reading weathered late pressure to end Preston's 12-game unbeaten run. Victory lifted the Royals up to 19th in the table, four points above the relegation zone, while Preston slip to ninth but only two points away from a play-off spot. The visitors were forced to play the final stages of the game with 10 men after Ben Pearson limped off injured and boss Alex Neil had already made all three substitutions. Meite smashed in his ninth goal of the season after John Swift's superb through ball allowed Barrow to provide the striker with an easy finish from six yards out. Barrow then latched onto a misjudged back-pass by Ben Davies before rounding goalkeeper Declan Rudd to score. Ovie Ejaria almost grabbed a third on the stroke of half-time but his shot from the edge of the box was pushed onto the post by Rudd. The Lilywhites dominated possession throughout the match, but only managed one shot on target before they grabbed their consolation. "The brave way that they (the players) closed the offensive actions of this dangerous tough team, they deserved to get the three points. "We cannot forget that we played against a team that in the last 12 games, they didn't lose. The last six games away they won, so they were full of confidence. "We showed during this game that we were able to stop them and beat them. "I just hope that next Saturday can be good as well for us. It's game by game." "I didn't think certainly in the early part of the game, there wasn't anything in it. "We have only really got ourselves to blame for the first two goals. "It doesn't matter what team you play in this league, if you gave them two goals at the start it's always going to be tough afterwards. "We wanted to win the match today so that's why the lads are disappointed and frustrated because they know how good they have been and how good they can be." Match ends, Reading 2, Preston North End 1. Second Half ends, Reading 2, Preston North End 1. Attempt missed. Tyler Blackett (Reading) left footed shot from more than 40 yards on the left wing misses to the left. Assisted by Callum Harriott. Attempt missed. Joshua Earl (Preston North End) header from the left side of the six yard box is close, but misses to the left. Assisted by Darnell Fisher with a cross. Goal! Reading 2, Preston North End 1. Jayden Stockley (Preston North End) right footed shot from the centre of the box to the centre of the goal. Sean Maguire (Preston North End) hits the left post with a left footed shot from the centre of the box. Assisted by Joshua Earl. Ben Pearson went off injured after Preston North End had used all subs. Attempt missed. Paul Gallagher (Preston North End) right footed shot from the right side of the box misses to the left. Assisted by Jayden Stockley with a headed pass. Attempt missed. Garath McCleary (Reading) right footed shot from outside the box is too high. Assisted by Andy Yiadom. Attempt missed. Yakou Meite (Reading) left footed shot from outside the box is high and wide to the left. Assisted by Andy Yiadom. Attempt missed. Louis Moult (Preston North End) right footed shot from the centre of the box is just a bit too high. Assisted by Sean Maguire. Attempt saved. Louis Moult (Preston North End) left footed shot from outside the box is saved in the centre of the goal. Substitution, Reading. Paul McShane replaces John Swift because of an injury. Delay in match John Swift (Reading) because of an injury. Substitution, Preston North End. Louis Moult replaces Brandon Barker because of an injury. Corner, Preston North End. Conceded by Matt Miazga. Attempt blocked. Ovie Ejaria (Reading) right footed shot from outside the box is blocked. Assisted by Andy Rinomhota. Corner, Preston North End. Conceded by Andy Yiadom. Second Half begins Reading 2, Preston North End 0. Substitution, Preston North End. Brandon Barker replaces Callum Robinson. Substitution, Preston North End. Jayden Stockley replaces Lukas Nmecha. First Half ends, Reading 2, Preston North End 0.